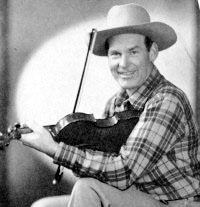 The Arkansas Woodchopper or as he was called "Arkie" was one of the mainstays of WLS' National Barn Dance show. He was a native of the Ozark mountains, near Knobnoster, Missouri and was said to have actually chopped wood. He also worked on his father's farm and at a general store in town and was later a gas station attendant. The story goes that he used to trap. So, once after selling some skins one day, bought a watch. At the time, he was already calling square dances at parties, but had an itch to play the fiddle at the dances, too. He pawned the watch, bought a fiddle and learned to play. Jos first jobwas playing the guitar and fiddle at at square dance, for $4.00, for SIX hours! Later, when performing, it was usually with his guitar. When he did play the fiddle, it wasn't from the shoulder position, but from the hip, using a sort of cross-cut saw action. Arkie's singing and radio career started in Kansas City. During the war years they said he had a good reputation as a weather prophet, but that it couldn't be talked about, for military reasons. He was said to be just like some of the fruit cake they made down in the hills: the older it got, the better it was. The National Barn Dance made appearances regularly at the Illinois and Indiana State Fairs. In 1932, they wrote that they came in at five o'clock in the morning to watch as well as listen to the show. 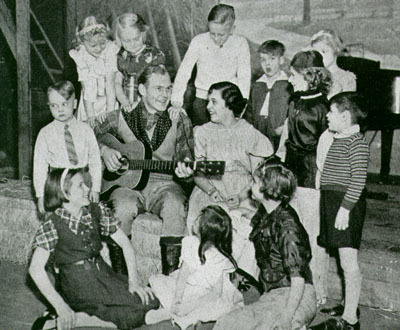 In the WLS Family Album of 1938, they noted that Arkie was chosen by vote of the listeners as one of the three most popular acts on WLS. Arkie evidently enjoyed to laugh. Early on they said that "...some of the boys found it was a lot of fun to make him laugh in the middle of a song, inventing the most outlandish stunts to accomplish this. Since then, Arkie's laugh has been heard from coast to coast." And they say he never knew what to expect. In another issue, they wrote that no one had ever gone through what he had to go through while performing. Manhandled. Wrapped in bandages. Sheet music set afire. Guitar pulled out of tune. Shoes unlaced. And he laughed and sang right through it all. Had a daily radio show called "Arkie's Coffee Time"
7881 B What Is Home Without Love?